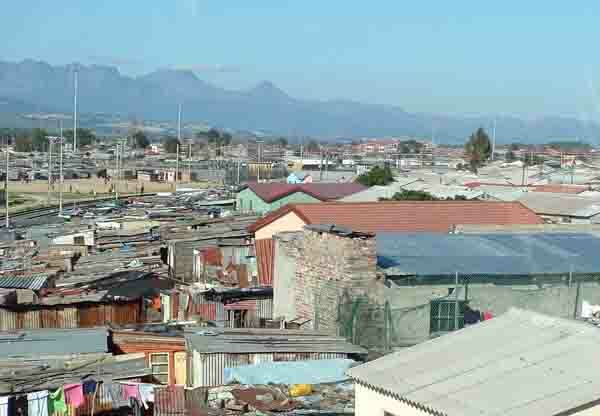 Khayelitsha (“New Home”) is a large township about 35 kilometres from the centre of Cape Town. It is the fastest growing township in South Africa and at present houses more than 400,000 people in formal and informal housing. The township, is approximately 21 years old and has grown considerably from its dusty beginnings in the early 1980s when families began settling there. Khayelitsha from the air appears to be well laid out with roads and formal housing that is being built with government subsidies. Unfortunately, although there are ongoing building projects to provide housing for the people, many thousands still live in wood and iron shacks on the outskirts of the township. Life is really hard. Shacks are built close together and fires often break out raising whole settlements to the ground. Although many shacks have electricity they do not have running water or toilet and bathroom facilities. Toilets are built hundreds of metres away and cater for the whole community instead of being one per household as you would find in most modern societies. Water has to be carried from a central tap. Conditions in the formal area of Khayelitsha are improving quickly. A local business support centre, which serves as a base for micro entrepreneurs has been developed. It provides training programs such as sewing, doll making and pottery for women. Once trained the women start their own home businesses and sell all the goods they produce. Unbeknown to most Capetonians, Khayelitsha is the first black township to own its own community radio station. Zibonele Community Radio station broadcasts from a shipping container within the informal settlement of an area called Town Two. The station's name which means “self reliance” broadcasts in Xhosa and has been on the air since 1995 . Its main focus is community health. With the increase of tourism in the Western Cape ,Khayelitsha is doing its best to attract its share of visitors. Tour companies offer tours into the township where you can experience a bit of township life. For those who would like to stay over there are a number of bed and breakfast establishments where one can enjoy traditional African meals such as mutton stew and maize porridge. Local African brews such as Amarhewu are also on the menu. What is Khayelitsha doing to attract tourists? Khayelitsha is developing a lookout area on a hill near its Mitchells Plain entrance which will become a permanent attraction. It will include a restaurant, arts and crafts centre and a number of drama studios. For golfers, Khayelitsha is the first black township to have a golf course. A tourism information centre has been established at Oliver Tambo Recreation centre in Mew way road. This centre serves as a multi-purpose indoor sport arena and was built during South Africa's unsuccesful 2006 Olympic Bid. Over the next few years Khayelitsha can become one of the main tourist attractions in the Cape. At present however, it is not safe to venture into the township on your own. Crime is rife, with car highjackings, murders, rapes and theft being common occurrences. Tour companies trading in Khayelitsha have developed links with the the locals and will take tourists to areas where it is safe for visitors to go. A visit to Khayelitsha will open the eyes of the visitor to a life one can only experience in a township. If and when you visit Khayelitsha enjoy the tour, it will be an experience of a lifetime.